The flagship Pirelli tyre, the Pirelli P Zero, is the number one selling tyre for Pirelli available in a massive range of sizes and options including extra load and winter models. The Pirelli P zero is often considered the benchmark for ultra high perfomance tyres, designed for use on all cars but with high end sports, 4x4's and sports editions benefiting from it's features the most. Used as original equipment on a massive range of high end cars including Audi's Bentely's, Ferrari's, Maserati and even Lamborghini's & Porsche. Incredible performance in both the wet and the dry as would be expected from such as high end tyre, combined with low noise emissions. 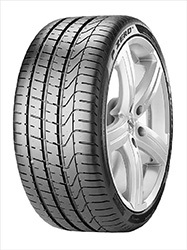 Available in a huge range of size combinations this is a great premium tyre choice for everyone.